Using the fungicide application process to improve the condition of your lawn should only happen upon the consultation of a lawn care professional. Some lawn fungus is incorrectly diagnosed because it often looks like patches of dead or dying grass, and sometimes it’s hard to pinpoint the cause of dead patches. It’s always best to call an expert to be sure the correct products and techniques are applied to correct lawn problems. White, yellow, or brown patches of dead and dying grass. Thinning patches of frayed or discolored blades. Blades of grass with Gray, black, or purple spots. Powder on and around grass blades, often gray or pink in color. Patches of greasy-looking grass that is slimy to the touch. What are the steps in the fungicide application process? The first step in the fight against lawn fungus is prevention. Cool temperatures and moisture activate fungus spores. This is why it’s important to water grass during the day in the fall and spring months. Proper aeration promotes soil drainage, which also helps prevent fungus from activating. Contact fungicides only the surfaces of the plant that are sprayed. Translaminar fungicides are sprayed on upper leaf surfaces and trickle down to also treat the lower, unsprayed surfaces. Systemic fungicides travel through the inside of the plant and will treat it top to bottom. Fungicide products usually come in liquid or powder form. They are carefully applied to the affected areas to kill fungus and encourage the grass to grow back. Some fungicide products also have preventative qualities that can keep fungi from becoming a problem in the first place. The main ingredient in most fungicides is sulfur; therefore, extreme care must be taken when applying these products. Which type of product will work best for your lawn? That decision is best left to an expert. It depends on the strain of fungus present on your grass, the severity of the fungal damage, as well as the type of grass growing in your yard. 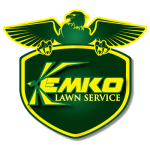 Kemko Lawn & Shrub has served homeowners in Atlanta for over three decades. We know what turf types and fungal strains are common in the area, and we know how to treat these problems fast and effectively. Call us at 770-466-6113 to schedule your fungicide application process.